Dale Earnhardt, Jr. picked up the 8th last-place finish of his NASCAR Sprint Cup Series career in Sunday’s CampingWorld.com 500 at the Phoenix International Raceway when his #88 Nationwide Insurance Chevrolet was involved in a single car crash that ended his race after 179 of the race’s 312 laps. The finish came in Earnhardt, Jr.’s 545th series start and is his first since last year’s Duck Commander 500, the spring race at Texas, 33 races ago. Earnhardt, Jr. rebounded from his fiery Texas exit with a runner-up finish the next week at Darlington, ultimately leading to a season sweep of both races at Pocono after a pair of late-race charges to the front. A championship bid that began with a victory in the Daytona 500 reached its end with a crash that fall at Talladega, but the very next week at Martinsville, he earned his fourth win of the year by muscling past Tony Stewart with 4 laps to go. In terms of wins (4) and Top Fives (12), 2014 was Earnhardt, Jr.’s best season since 2004, when 6 wins carried him to 5th in the inaugural Chase. This year, with new sponsorship from Nationwide Insurance, Earnhardt, Jr. picked up where he left off, earning a pair of 3rd-place runs in the Daytona 500 and Atlanta, then a 4th at Las Vegas. Only Vegas and eventual Phoenix winner Kevin Harvick, now on a streak of 7 straight top-two finishes, was off to a better start. Coming into the Phoenix race, Harvick led Earnhardt, Jr. by just 9 points. At Phoenix, Earnhardt, Jr. was 8th-fastest in the opening session, then just missed the final round of qualifying with the 16th-fastest time at 138.814 mph. On Saturday, he began the day 11th fastest in the next practice session, then improved to 6th-best in Happy Hour. Sunday’s 43rd starting spot went to Alex Kennedy, the fourth different driver in as many races to drive the #33 Chevrolet. Kennedy, who was making his first Cup start since last August at Michigan, passed Mike Bliss on the opening lap, dropping Bliss’ #32 DraftDemons.com Ford to the back of the field. Bliss only held the spot for a moment when trouble broke out in the middle of the pack. 18th-place starter Brian Vickers was trying to slot his #55 Aaron’s Toyota in front of Jimmie Johnson’s #48 Lowe’s Chevrolet when the two made contact, turning Vickers’ machine hard into the outside wall just past the start/finish line. Vickers’ damaged car stopped up the track in Turn 1, bringing out the first yellow of the day. With severe damage to the right-front of the #55, Vickers quickly took 43rd from Bliss and went behind the wall for nearly 80 laps of repairs. Vickers was still in the garage on Lap 63 when Michael Annett’s #46 Pilot / Flying J Chevrolet, then running a lap down in 38th, slowed suddenly exiting Turn 2. Reports from the team’s Twitter indicated the #46 had transmission issues. Vickers brought his battered car back onto the track on Lap 83, then bumped Annett to last on Lap 140. Although hard work by the HScott Motorsports team managed to get Annett back on track around Lap 170, the #46 was still 110 laps down, apparently headed to the first last-place finish of Annett’s young Cup career. Then, on Lap 182, Earnhardt, Jr.’s right-rear tire exploded as he ran the high lane down the backstretch, causing his right-rear to slap the outside wall. The contact did a surprising amount of damage, virtually tearing the rear clip from his Chevrolet, and sending him spinning to the apron. Although no other drivers were involved in the wreck, the right-rear of the #88 then caught fire at the entrance of pit road. The car’s onboard fire extinguishers kept the blaze in check, but once they were activated, Earnhardt, Jr. was unable to return to the race, making him the first retiree from the event. Earnhardt, Jr. is now 6th in points, 56 behind Harvick, but 4th among drivers without a win in 2015. Annett finished the race under power to come home 42nd, 28 laps behind Vickers in 41st. 40th went to Sam Hornish, Jr., who had also blown a right-rear tire 70 laps before Earnhardt, Jr.’s wreck. Initial reports indicated both tire failures were due to melted beads. Hornish pulled behind the wall with 18 laps to go, but official results indicate his #9 Medallion Bank / Camping World Ford was still under power at the finish. Not so fortunate was Tony Stewart, whose physical run into the Top 10 ended with a pair of crashes in the closing laps, the second knocking his #14 Bass Pro Shops / Mobil 1 Chevrolet from the race on Lap 290. 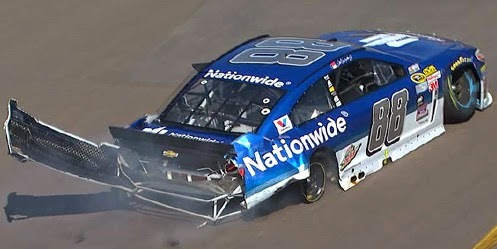 *This is Earnhardt, Jr.’s second last-place finish in a Cup Series race at Phoenix. On November 11, 2007, his #8 Budweiser Chevrolet was involved in a single-car accident on Lap 120, ending his run in the Checker Auto Parts 500. He did not finish last again until the Texas race of a year ago. *This is the first last-place finish for the #88 in a Cup race at Phoenix. *This marks the 7th consecutive Cup Series last-place finish by Chevrolet. The last time 7 Chevrolets finished last in a row occurred from September 25, 1977 through January 22, 1978: Baxter Price (Martinsville), Junior Miller (North Wilkesboro), Bruce Hill (Charlotte), Lennie Pond (Rockingham), Jimmy Means (Atlanta), Donnie Allison (Ontario), and Gary Johnson (Riverside). https://www.youtube.com/watch?v=dWM83xQFVnw <-- Shows #9 at :20 , by the paint scheme.